Ever wondered what would if "The Grey" got directed by a less talented director, with even a lesser budget? Well, "6 Below: Miracle on the Mountain" is your answer. This movie apparently got based on a true story, but it unfortunately really doesn't do much justice to it. It is an extremely shallow and overall poorly done film, that is devoid of any good emotions, tension, or anything else to make this a compelling and effective enough genre movie. 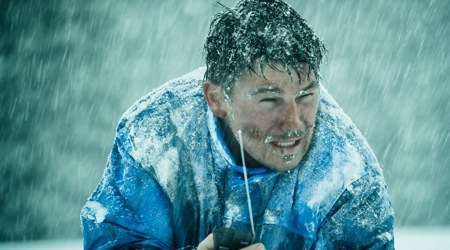 It is a very typical man versus nature flick, in which the main character gets stuck on a snowy and cold mountain. How can you possibly mess such a simple premise up? Well, very easily, as this movie clearly demonstrates. It is hard to blame it on one thing, since the movie is doing an awful lot wrong. As a matter of fact, it is doing very little right, which sounds harsh, but it just is so extremely hard to name one thing about this movie that is good or remotely memorable. As I said, one of the things with this movie is that it feels extremely shallow. There are actually multiple reasons as to why. One of them is that the movie is far too 'filmic'. What I mean by this is that it is a far too slick and planned out looking one for a movie with such a realistic and raw concept and main story. There is absolutely no realism to anything. Whenever the Hartnett character is cold, it never feels like he is cold. Whenever the Hartnett character is in pain, it never feels like he is in pain. And whenever the Hartnett character feels lost and sad, it absolutely never feels like anything realistic neither. It is a poorly done film, both visually as well as emotionally. The many flashbacks in the movie are there to make the character a more sympathetic and 'human' one, but it just feels like a cheap trick to do just that. We don't get to know anything about the character by simply following him around and watching him dealing with the circumstances he is suffering- and struggling against. I also really don't get how the whole message behind the movie is 'getting a second chance', as if the main character was supposed to be all messed up and lost before he went up the mountain. It makes the story and message behind the movie a pretty odd and weak one. It definitely made some wrong choices with its character and story all throughout. The character also remains a far too shallow and uninteresting one and it is therefore hard to care about anything that is happening in this movie and to its main character. Not even really Josh Hartnett's fault, but I blame it on the writing and directing instead. It is also true that none of the emotions really work out because the movie is mostly focusing on its one main character. It lets all of the other characters and their story-arcs come across as redundant ones, that don't share a solid enough connection with its main character. Even the mother character feels totally out of place, as if she has never even met the main character and shares no connection with him. Not the worst movie you will see this year, but it is one that is hard to be very positive about. A far too shallow and lackluster man versus nature movie, that luckily isn't too long to watch. There, I still said something positive about this movie...Well, sort of, I guess.